Dr. Byron McKnight brings a wealth of education and experience into every visit to his office. He also employs a staff of top-notch dental hygienists to provide preventive care including regular thorough cleanings and oral hygiene education. When you visit Dr. McKnight’s Mesquite dental office for your general dentistry needs, you also have the added benefit of spa dentistry services, including massage and aromatherapy, taking what would normally be a routine dental care trip and turning it into a relaxing, enjoyable experience. General dentistry may sound simple, but your visit to Dr. McKnight’s office will be anything but routine. We provide general dentistry services from routine exams and cleanings to nightguards for bruxism (teeth grinding) and more. Because preventive dental care begins at home, we’ll educate you on how to properly brush, floss, and check for problems such as gum disease. 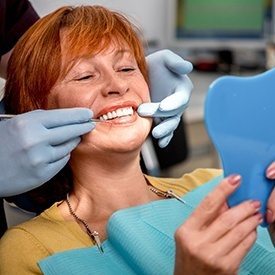 And, if dental anxiety has kept you from visiting the dentist, we can provide your care using sedation dentistry, creating greater comfort and peace of mind. Most people should have a checkup and cleaning at least every six months. 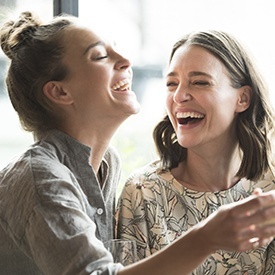 This is the frequency at which we can closely monitor your periodontal (gum) and dental health to help you steer clear of tooth decay, gum disease, and other oral health hazards. During a checkup, Dr. McKnight will go through your mouth tooth-by-tooth to make sure these issues are not present. With a cleaning, your hygienist will remove plaque and tartar to leave your smile feeling fresh and smooth. For moderate levels of gum disease, scaling and root planing provide an effective treatment. Dr. McKnight is one of the only dentists in our area who uses a microscope to perform this treatment with the utmost precision and skill. Scaling and root planing with a microscope removes the infection at the source without harming healthy tissue. When combined with Arestin antibiotic therapy, gum disease can usually be arrested and managed successfully to ensure more damaging effects do not occur. 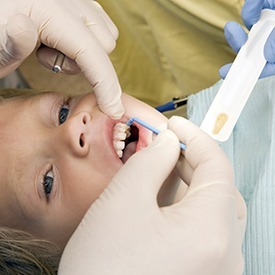 Another helpful preventive treatment is available with dental sealants. 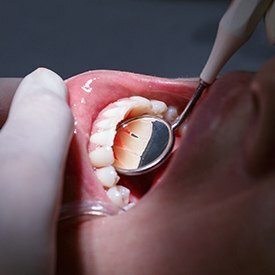 These are thin plastic coverings that are painted directly onto the molars and premolars to prevent the buildup of food particles and bacteria that can lead to tooth decay. This preventive treatment is especially helpful for patients who are at a higher risk of developing cavities. Dental sealants are applied within minutes and can provide years of protection against tooth decay. 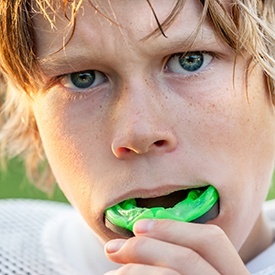 If you play a contact sport, your smile is vulnerable to injuries that can result in a dental emergency— unless you protect the teeth with a customized sports mouthguard. This is a small, plastic device that can provide significant protection for athletes playing sports ranging from football to wrestling and hockey. A sports mouthguard is customized to your bite, and it can keep everyone’s smile safe out on the field, court, or rink. Nighttime teeth grinding (aka bruxism) is a common condition amongst adults, and it’s one that can have significant long-term effects on oral health. Teeth grinding and jaw clenching gradually wear away at the tooth enamel, leaving you at a higher risk of developing tooth decay, sensitivity, and maybe even tooth loss. 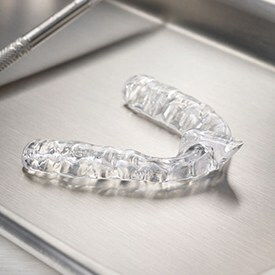 A customized nightguard from Dr. Byron McKnight can help protect your tooth enamel and prevent the harmful effects of nighttime teeth grinding. Oral cancer is on the rise in the U.S. and around the world, and the need for regular screenings has never been more important. 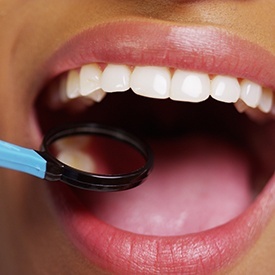 As with any disease, the early detection of oral cancer is crucial for successful treatment. Dr. McKnight can perform an oral cancer screening at the end of a checkup and cleaning — it’s a quick but thorough visual examination that also includes X-rays and photographs, which help to monitor any changes that may occur over time. The mineral fluoride is an important part of any preventive dental plan. Fluoride remineralizes the tooth enamel, preventing the development of weak spots that can eventually turn into cavities. Toothpaste that has the ADA seal of approval will contain fluoride, and most tap water sources in the U.S. do, too — but we can give you an additional boost of it at a checkup and cleaning.